Every useful watt of power you generate while cycling is transferred to your bike through the bottom of your feet. Foot pain, in particular arch pain, is common, and heel soreness can be caused by ill-fitting footwear or incorrect cleat position; equally, it may be the result of an underlying foot condition such as plantar fasciitis or a biomechanical issue. 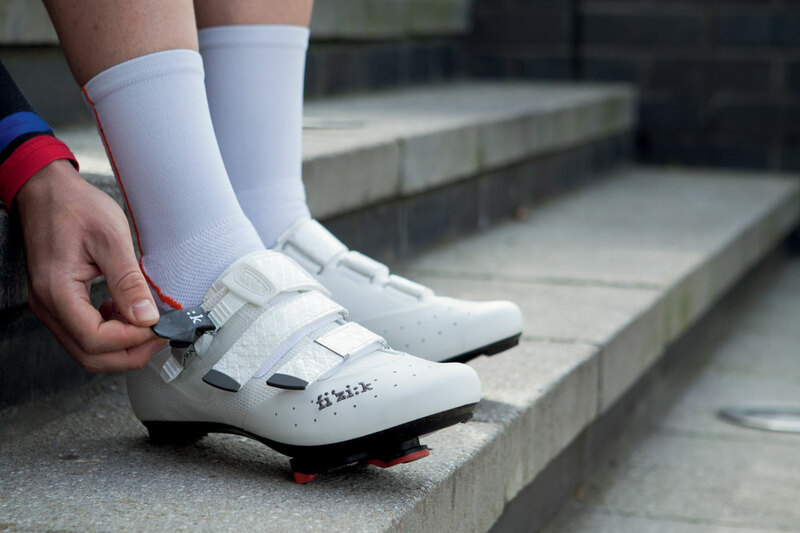 Poorly fitting cycling shoes may cause friction issues, resulting in blisters and skin sores. Bike-fitters warn against buying cycling shoes without first trying them on to ensure good fit. An overly tight, ill-fitting pair of shoes can compress the metatarsal arch (across the ball of the foot), leading to foot numbness and sharp, stabbing pains. Foot pain can be seriously limiting, but with proper care and a few adjustments, most of the underlying causes are relatively easy to correct. The plantar fascia (aponeurosis) is a broad, thick band of connective tissue that forms a protective layer over the arch of your foot, enabling you to walk barefoot. It runs from the tuberosity of the calcaneous (heel bone) along to the metatarsal heads (ball of the foot). Interestingly, the plantar fascia tightens as your big toe extends during the toe-off phase of walking or when pushing down onto the ball of your foot; this is called the ‘windlass mechanism’. When the plantar fascia tightens, the medial arch stiffens, allowing the transfer of power through the sole of your foot. One of the most likely causes of pain in the arch of your foot is inflammation, strain or repetitive micro-tears of the plantar fascia. This condition is called plantar fasciitis and is very common among cyclists and others whose activities place large amounts of stress on the palmar (underside) aspect of the foot. When the plantar fasciitis is endured rather than treated, it can fail to heal properly because of collagen degeneration. This may lead to the creation of calcium deposits, also known as a bony spur. A bony spur at exactly the point where the plantar fascia inserts into the calcaneus tuberosity (heel bone) can lead to chronic heel pain. What are the causes of foot arch pain? Foot arch problems are very common. Many of these issues have a genetic basis but may not become apparent until later in life. The structures forming your arches and ankles are complex, and it may be necessary to seek help to correct biomechanical issues such as excessive ankle pronation (turning in), pes planus (flat feet), pes cavus (high arches), leg length differences or a misaligned pelvis. If left untreated, biomechanical imbalances can contribute to shin splints, Achilles tendonitis, calf muscle soreness, knee joint weakness, hip or lower back pain. Finding a comfortable pair of wicking socks and good pair of cycling shoes that support your arches can go a long way towards preventing arch problems. Many of the top brands include different sized ‘wedges’ that slide into the insole, to tailor the fit to suit. Appropriate cleat position and cleat tension, with correct bike set-up to keep good form and posture on the bike, will also help. It’s important that your metatarsal arch (ball of the foot) is directly in line with the axis of the pedal for force transmission, otherwise excessive pressure through your toe flexors might strain your plantar muscle and can increase the risk of injury. If still using pedals with clips, try moving to clipless, which should help. Seeing your local practitioner (physiotherapist, osteopath or podiatrist) is usually a good starting point if you are having problems with your feet. He or she will help to ascertain which type of foot condition you are suffering from, and will offer advice on rehab exercises and how to manage your symptoms, as well as investigating potential underlying biomechanical causes. Practitioners now have access to a wide range of insoles called chairside shoe orthotics. These products can be adjusted or heat-moulded to an individual’s requirements, offering additional support for those with over-pronation and/or flat feet. People with more serious biomechanical issues may feel the need to consult a podiatrist to have a permanent, bespoke pair of orthotics constructed. This is often the best solution. Foot arch soreness or discomfort often responds well to a simple strengthening and flexibility route. Try completing these exercises immediately before and after each ride, and 24 hours after to alleviate foot pain. Step back with your left foot, and extend your toes up onto a small block or paperback book. Keep your left knee straight to stretch, then bend your right knee forwards to feel a stretch in you upper calf and arch of the foot while keeping your heel on the floor. Hold this stretch for 30 seconds and repeat three times. Use a Foot Rubz massage ball (or similar) to help relieve muscular tension or soreness that has built up in the arch of your feet. Slowly roll your foot forward and back over the massage ball for two minutes. You can alter the depth of massage by standing or sitting. Repeat to massage the inner, middle or outer part of your foot arch. This is called a sagittal foot rocker and should be performed barefoot to strengthen your foot arch. Step forwards, lifting up your toes, then place your heel down firmly. Roll your weight on to the mid-foot while working the muscles in your foot arch and clenching your toes to the floor. Continue moving forward, up on to the ball of the foot, then push off from your big toe to transfer your weight on to your other foot. Now reverse the move: place your big toe down first, move your weight onto the ball of the foot, mid-foot, then heel. Rock back and forth over one foot arch for one minute, then repeat on the other foot.